When I start to paint, the memories of times when I’ve stood at the ocean come to mind. There are swirls of color and ever-changing patterns of light captured in the water that fascinate me when I am watching the waves. Ocean waves undulate in infinite contrasts, highlights and shadows. To me, there is a feeling captured in each moment of time standing at the ocean. In a painting, I want to convey those captured moments of feeling with all its motion, color and light. The first thing I do is to remind myself of something I’ve seen in the water that I would like to create. Strangely, this isn’t always found in a photograph of the ocean or even of water. These rarely capture the intertwining motions of light and color found in the ocean waves. 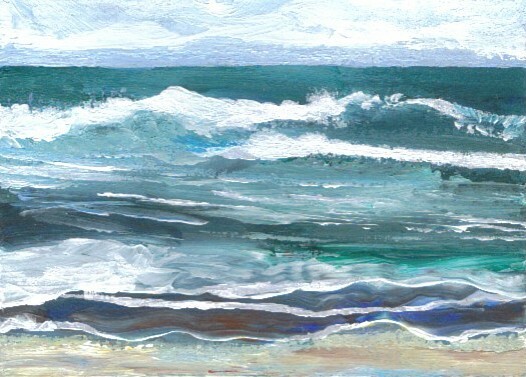 am trying to learn to paint ocean water, transparent water with little waves on a beach .Do you have any DVDs that I can buy, or suggest some to me,that would be good, and where I can get them, Thankyou, MILAN CVJETIC.